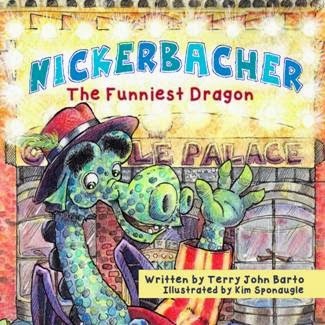 Coming out on Monday March 23rd is author Terry John Barto's second book, Nickerbacher: The Funniest Dragon. It tells the story of a dragon who wants to follow his dreams and be a comedian instead of what his papa wants him to do, to guard princesses. With encouragement from the princess he protects, he gets to fulfill his dreams and encourages a prince to become a baseball player along the way. Its a great story with a strong message to follow your dreams. My wife has made sure our son is an avid reader. So much so, that this book for 5-8 year olds is actually a little below his reading level. That being said, its still a great story. I can see kids starting even younger with the book where the adult reads to them. Thanks to the great illustrations, the younger crowd will be able to hear the great story sooner and enjoy the pictures. Illustrator Kim Sponaugle has done a great job with the illustrations. I thought I had seen her work in some of her other works but I didn't recognize any titles. She really helps to bring the story to life. From the huge eyebrows on the dragon to his Hawaiian shirt at the autograph signing, the reader is really drawn into the story thanks to Kim's hard work. The book has won the Mom's Choice Award, where they select quality products and services for children and families. Given its strong family-friendly message, I can certainly see why. The author's first book Gollywood, Here I Come also won the award. We reviewed that book back in October. 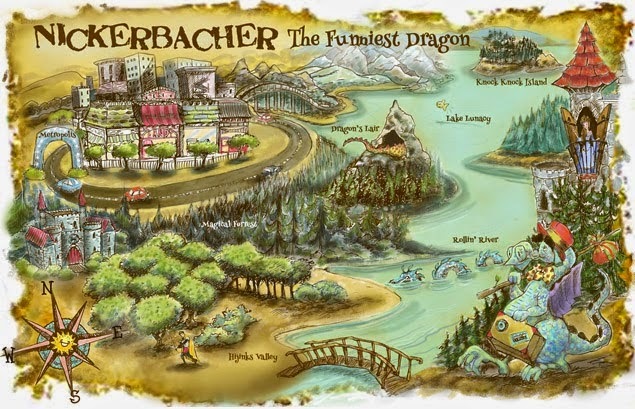 Overall, the Nickerbacher book is a great story to expose to young children, letting them know it is okay to follow their dreams. You hope they still listen to their parents for the important stuff, but this let's them know that if they don't want to do gymnastics or play an instrument or another activity their parents want them to do, its okay to say so and try out something else instead. Now for your chance to win a copy. The giveaway runs through 11:59pm on 4/5/15 and is open to US residents. One of my favorite childhood books was "The Story of Ferdinand." We liked Bambi as a kid and the book was a joyful experience. I liked Anne of Green Gables. I loved the little house series of books as a kid. I loved the Little Women books. My son always liked the Little Critter books & the Berenstain Bears.